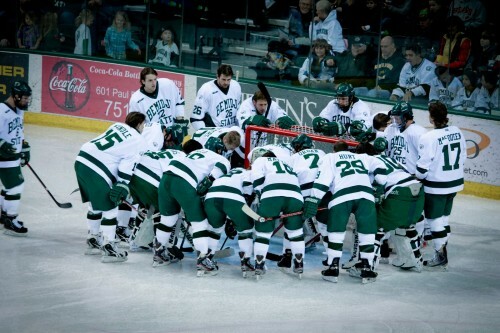 The Bemidji State men’s hockey team got swept by No.7 Minnesota last weekend at Marriucci arena in Minneapolis. The Beavers were out-shot 68-35 on the weekend. The Gophers scored in the first minute of the game Friday when Zach Budish scored. Mark Alt and Kyle Rau assisted on the goal. Eight minutes later, Budish scored again to give Minnesota an early 2-0 lead. BSU got just two shots on goal in the period. Minnesota capitalized on a power play in the second period when Nick Bjugstad scored. Rau and Erik Haula were credited with assists. Bemidji State totaled just 13 shots on the night, and Gopher goaltender Kent Patterson stopped all of the shots on his way to the 3-0 shutout. David Boehm, Darcy Findlay, and Brad Hunt each mustered two shots. BSU senior goaltender Dan Bakala made 33 saves on the night. Minnesota wasted no time scoring on Saturday as it scored at the 1:17 mark in the first period. Haula scored his 13th goal of the year to give the home team another early lead. The Beavers scored on a power play late first period when Hunt scored his fifth goal of the season for the team’s first goal of the weekend. Jordan George and Matt Prapavessis each picked up their 11th assist on the play. Jake Hansen scored early in the second period to re-gain the lead for Minnesota. Haula added another goal late in the period to give the Gophers a 3-1 lead after two periods. Seth Ambroz added a late empty-net goal to seal the 4-1 win for Minnesota. David Boehm led the Beavers with four shots on goal. Patterson finished with 21 saves on the night, and Bakala finished with 28 saves in the loss. Bemidji State (15-14-3 9-12-3 WCHA) will return home to face Wisconsin this weekend at the Sanford Center for its last home series of the season.